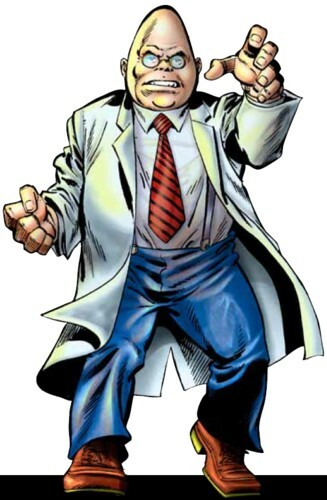 Powers/Abilities: Over the years, Egghead brilliantly designed many scientific wonders to aid him in his schemes, including a device to communicate with and influence ants, a dewelding gun, a living cell beam, a vibration gun, a strength-enhancing compound, a size-increasing ultra-beta beam, a beta-ray mental energy transmitter, a warfaring space station, an orbiting death ray, a paralysis ray, a mind-draining Hypno-Kon, teleporting mento-transmitters, power augmenters, brainwashing technology, trick eggs (including expanding cloth, electrified, bola, and containment), a powerful cybernetic arm (with mind-control technology and enhanced strength), and other devices. Egghead is a master at robotics, having disigned the "Egg-bots" and an android. (Conspiracy#1 (fb)) - General Slinkard met with Starr, before the latter became Egghead. (Marvel Feature I#5 (fb) - BTS) - Egghead was a kind uncle to his niece, Trixie Starr, a child prodigy. (Tales to Astonish I#38/1) - When the government suspected Starr of selling atomic secrets to foreign powers, they fired him from his job at the Atomic Energy Board. (Tales to Astonish I#38/Official Handbook of the Marvel Universe Deluxe Edition#17 (fb) - BTS) - Several New York City criminals offered Starr (whose nickname was Egghead, granted by various tabloids reporting on his crimes) twenty thousand dollars and a clearing of his criminal record to defeat the new diminutive hero, Ant-Man. (Tales to Astonish I#38/1) - Starr researched the hero and determined that the ants that aided Ant-Man must think themselves his slaves. He devised a way to communicate with ants and sent a message to them, stating that he would free them from slavery if they would lead Ant-Man into a trap. He had his thief allies stage a robbery at the museum and waited for Ant-Man to enter. Egghead blew Ant-Man into fly paper with a bellows, but Ant-Man was prepared and made short work of the thieves. Egghead escaped, and overheard Ant-Man stating that the ants were his friends, not his slaves. Distraught, Egghead muttered to himself as he returned to the flophouse he was staying at. (Untold Tales of Spider-Man: Side by Side with the Astonishing Ant-Man) - Henry Pym, interested in reports of Spider-Man (somewhat intrigued that another arthopod based figure should emerge) sent out a psychic communique amongst the ant community, directing them to watch for Spider-Man. Egghead intercepted this communique, thinking that the Ant-Man sought to apprehend Spider-Man as a fugitive, and the next day, between two buildings, piloted a large robotic tarantula that could spin webs. Ant-Man and Spider-Man both investigated this incident. (Tales to Astonish I#45/1) - At the flophouse, Egghead met up with two thugs, Ape and Twister, who'd recently been defeated by Ant-Man, and who informed Egghead of Ant-Man's new partner, the Wasp. Egghead devised a new plan and, in disguise, established himself as insect expert Carl Striker, soon getting invited to speak at the zoo about wasps. 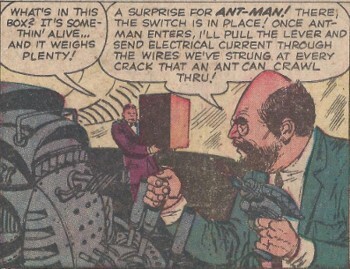 He developed another device to scramble the ants' signals so that they could not contact Ant-Man. Using a specially-designed Electronic Dewelding gun, Egghead and the thugs successfully stole Anton Myers' special diamond pendant, then planted it into a wasp-nest replica at the zoo. Wasp, in attendance at Striker's exhibit, saw the pendant, and returned later to retrieve it, but Egghead trapped her in a maze and she had to call Ant-Man for help. Ant-Man arrived and was led into a cage with a large iguana, which Ant-Man soon defeated. Egghead then released an anteater on Ant-Man and Wasp, having placed electronic wires around all crevices in the room to keep the heroes from fleeing, but Ant-Man made short work of the anteater, hurling it into the thugs. He and the thugs then tried to use water pistols filled with liquid gas, but Wasp hit Egghead with a needle, making him drop the pistol. Egghead escaped, but Ape and Twister were captured. (Tales to Astonish I#57/1) - After months in hiding, Egghead felt ready to attack Ant-Man (now Giant-Man) and Wasp anew. He influenced local ants to send a message that Spider-Man was after him. He watched as the heroes fought each other, then mobilized his own forces to loot the city while everyone was distracted with the heroes' fight. They robbed an armored truck, then were attacked by Giant-Man, Wasp, and Spider-Man. Egghead tried to tempt them to join his side, but they turned him over to the police. (Alpha Flight Special Edition II#1) - Egghead took up a new residence in Canada and arrogantly introduced himself to his staff. He recruited several new American super-villains, including Eel (Stryke), Porcupine (Gentry), Power Man (Josten), Swordsman (Duquesne), Rhino, and Solarr, calling them his Emissaries of Evil. He showed them the nuclear warhead he had procured. Egghead stood in front of the missile, with his allies on hand, and announced on camera to millions that he would launch the warhead into New York City unless the President of the United States signed over leadership of America to Egghead. Egghead explained to his Emissaries that he would likely have to destroy New York before anyone took him seriously. Soon an early version of Alpha Flight (Groundhog, Saint Elmo, Smart Alec, Snowbird, Stitch, Wolverine) arrived and defeated most of the Emissaries. They realized that the bomb would detonate when they investigated, and Egghead refused to dismantle it even when Wolverine threatened to kill him. Saint Elmo sacrificed his life to stop the explosion. (Avengers I#63 (fb) - BTS) - Egghead, having studied up on new fields in prison, escaped jail and teamed up with Mad Thinker and Puppet Master. The three of them plotted together, and captured investigating S.H.I.E.L.D. agent, Black Widow (Romanoff). (Sub-Mariner I#14 (fb)) - The trio plotted to destabilize America, gaining control of the country, from three different fronts. The Mad Thinker enslaved World War II hero Toro into planting a bomb in a mountain. (Avengers I#64 (fb)) - Egghead developed a space station with which to wreak havoc on the world. He tried to recruit hoods, including Barney Barton, to follow him, but they refused. Egghead sicced a robot he'd developed against them, slaying two of the hoods, but Barton escaped. (Avengers I#63) - Egghead manipulated radio waves to transmit a false message of Nick Fury to the Avengers, sending them on a wild goose chase after the Widow, but she still managed to send a distress call to Hawkeye, who imbibed Pym's formula and became the new Goliath. The villainous trio saw Goliath coming and assumed him to be Pym. They unleashed a giant android to fight Goliath and then rushed away. Goliath defeated the android and rescued Black Widow. (Sub-Mariner I#14) - While Mad Thinker had Toro attack Sub-Mariner, the trio of villains crippled electrical power across America, and Egghead issued an ultimatum to the country. However, Sub-Mariner and Toro were able to stop Mad Thinker and destroy his Caribbean base, and this portion of their plot failed. (Captain Marvel I#14 - BTS) - Egghead was the Puppet Master's unseen partner. (Avengers I#64) - Aboard a satellite, Egghead warned the citizens of a small mid-western town to evacuate, then he destroyed the town with a powerful death-ray. He vowed to destroy more towns unless the United States met his demands. Barney Barton went to the Avengers (Black Panther, Goliath, Vision, Wasp, Yellowjacket) for aid, and they infiltrated the space station, battling more of Egghead's robots. Egghead turned a paralysis ray on radioactive puppets of the Avengers that Puppet Master had created for him, and the Avengers were soon immobile. Barney Barton stormed the ray, however, causing it to blow up, an act which killed Barton. Egghead made a break for it and escaped. (Hawkeye: Blindspot#3 (fb) – BTS) – Egghead later returned to Barton’s body and found a spark of life still in it. He placed the body in suspended animation in one of his warehouses. (Avengers I#65) - Egghead, frequently quoting Shakespeare, hired his former operative Swordsman to capture Giant-Man from the Avengers, revealing to Swordsman that Hawkeye was one of the Swordman's old foes as well. Swordsman returned with Goliath captured, but revealed that Hawkeye was the new Goliath. Frustrated, Swordsman, using his trick sword, and Egghead, using a stun blaster, traded blows briefly before Egghead escaped. (Fall of the Hulks Alpha#1 (fb) - BTS) - The Leader approached Starr, respectfully not calling him Egghead, and invited him to join the Intel (or its longer form, the Intelligencia), a group of powerful scientists, including Dr. Doom, Red Ghost, and the Wizard. Egghead led them into recruiting the Mad Thinker as well. 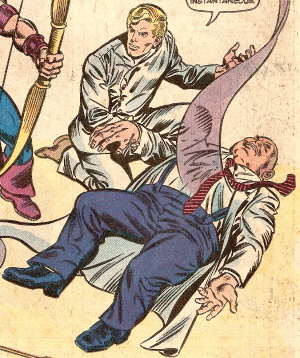 In their infrequent meetings, Starr often tried to suggest revenge plots on Henry Pym. (Fall of the Hulks: Alpha#1 (fb)) - The Intel (sans Dr. Doom), with the Awesome Android and the Super-Apes, used a combination of their powers to sneak into the Eternals' headquarters in Antarctica, bypassing Ikaris, Makkari, Thena, and Zuras, and into an authentic replica of the Library of Alexandria. They eagerly began pilfering its contents, including a large monolith and a cosmic Hulk robot. As they worked, Starr recorded each device and created carbon replicas of the ones they took. They returned to Dr. Doom's castle with the finds and plotted how to pilfer similar caches around the world. Months later, on a raid of Project PEGASUS, Starr was frustrated when the Nth Projector had already been stolen. (Marvel Feature I#5) - Egghead put together a plan to drain his niece's brain and apply her memories to a robot that would also house his consciousness, figuring this would be an unstoppable combination. While Egghead tried to force Trixie into his machines, he was subdued by Henry Pym, who was trapped at ant-size. Egghead tried to kill Pym, but Trixie knocked him out with a blow to the head. Trixie and Pym bonded over the next few hours. Hours later, Egghead tracked Trixie and Pym and captured them both. After "killing" Pym, Egghead forced Trixie into his Hypno-Kon and slowly broke through her mental barriers. Just as he was about to drain her mind, the power overloaded (due to Pym, who was still alive), and Egghead's van blew up, leaving Trixie and Pym to think him dead. She reminisced about her happy memories with her uncle. (Giant-Size Defenders I#4 (fb) - BTS) - Near penniless, Egghead began staying at the Bowery. He called Trish, asking for money, but she refused. Wanting Trish to suffer but not wanting to kill her, Egghead planted a bomb in her boyfriend Kyle Richmond's car, but siphoned enough gas to keep her from dying. 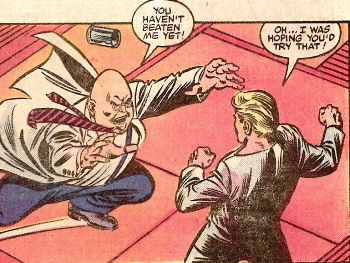 (Giant-Size Defenders I#4) - Returning to the Bowery, Egghead got in a fight with other patrons and was kicked out on the street. Pym, now costumed as Yellowjacket, tracked down Egghead and knocked him unconscious after Egghead confessed. Pym saw Egghead arrested. Trish ended up having an arm amputated due to the bombing. (Defenders I#42 (fb) - BTS) - After biding his time in prison, Egghead achieved parole and tricked a NASA guard so he could steal a NASA space station. He remained on the station, sending false reports that fooled NASA's computers, and equipped the station with an arsenal. He wanted minions and so teleported Rhino from the desert and Solarr from prison. He equipped them each with a mento-transmitter that allowed them to return to the station at lightning speed, and gave Solarr equipment that allowed him to utilize his powers at night. Egghead also found the drifting Cobalt Man, whom he brainwashed to destroy the Defenders. Wanting the precious Star of Capistan for his own, he deciphered that it had been transferred to Dr. Strange's possession and so sent his minions, called the Emissaries of Evil, to retrieve it. (Defenders I#42) - Rhino and Solarr returned, stating that Strange did not have the gem, and Egghead punished them by putting them in a time-stasis tube for ten hours. Egghead sent the Cobalt Man to fight the Defenders, and activated his nuclear arsenal, hoping to see the Defenders destroyed. (Defenders I#43) - After the Defenders successfully stopped Cobalt Man, Egghead refocused and sent Solarr and Rhino after Dr. Strange, ignoring their stated wish to kill Egghead. While they were gone, Egghead armed himself and moved against the Defenders. He first subdued the Hulk with an expanding cloth egg that engulfed him, then the Valkyrie with an electrified egg. After trapping Nighthawk with a bola egg, his containment egg failed against Power Man. He attempted to hit him with a power blast, but was punched instead. He saw Cobalt Man, who'd just been released from his brainwashing, and pleaded for help. Cobalt Man instead turned his powers on Egghead, seemingly disintegrating the both of them. (Avengers I#228 (fb) - BTS) - Instead of perishing, Egghead was teleported into the New Jersey swamps by an experimental mechanism he'd equipped his armor with. The teleporter had burned itself out, however. (Avengers I#217 (fb) - BTS) - Egghead, from his new penthouse apartment in New York City, plotted his final revenge on Pym. He designed a cybernetic arm that could be grafted on to Trish Starr, allowing her a fully functioning arm, but he also attached a cybernetic link that would allow him to control her mentally. (Avengers I#217) - Egghead tracked down Pym (who'd been ejected from the Avengers and estranged from his wife) and convinced him to hear him out. 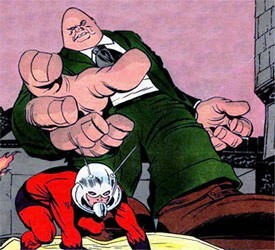 Though Pym was initially very critical of Egghead, the villain claimed he was repentant and that he only desired to have Pym present Trish with the new arm he'd designed. He offered Pym $500,000, but Pym turned down the money, though offering to give her the arm for free. Pym attached the arm later, and Egghead took mental control of Trish. He claimed the arm would self-destruct unless Pym followed his every command. He forced Pym to fly with Trish to Nebraska, where they robbed a stockpile of Adamantium resins from which Egghead planned to make an army of indestructible robots. Pym managed to summon the Avengers and Egghead forced the hero to battle them until he was defeated. He then altered Trish's memories so she'd think Pym was behind everything, and released his mental control of her. Pym was arrested for the crimes. (Avengers I#222) - Brooding over his most recent loss of Adamantium and reflecting on his being 52, leaving him little time in which to still rule the world, Egghead realized he was out of ideas. His maid, Anna, entered and suggested he invent something the entire world needed. Struck with inspiration, Egghead realized he could invent eternal youth, and that he'd need lackeys to do so. He soon liberated the captive Tiger Shark from Atlantis with a guided missile, then had Tiger Shark break into Rykers' Island prison and liberate Whirlwind, Scorpion (Gargan), and Moonstone (Sofen). They all gathered at a house headquarters on Long Island Sound, and Egghead explained that the benefits to following him would be great, but that crossing him would mean death. He appointed Moonstone as his deputy leader. He sent his team to procure medical research, but Whirlwind deviated and attacked the Avengers (Wasp, She-Hulk, Hawkeye (Barton), Thor (Odinson)). The villains were quickly defeated. Egghead, calling them his Masters of Evil, ruminated that perhaps they'd learned their lesson now. 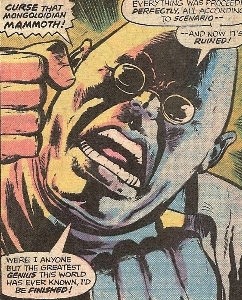 (Avengers I#227) - Egghead bugged the pencil of psychiatrist Paul Edmonds, who was sent in to interview Pym in jail about his involvement for the upcoming trial. Edmonds later talked to Iron Man, who informed him that Egghead was dead and couldn't be behind Pym. Egghead listened in, planning to ruin Pym's day in court. (Avengers I#228) - At the Long Island headquarters (at 13308 McKinley), Radioactive Man joined Egghead's group. Egghead greeted the new ally and explained that he was a fan of Radioactive Man's work. Tiger Shark and new ally Shocker (Schultz) burst through the ceiling in a fight, with new ally Beetle (Jenkins) right behind. Egghead quelled the arguments among the team members. Later, the Masters (Beetle, Moonstone, Shocker, Radioactive Man, and Tiger Shark) interrupted Pym's trial, claiming they were rescuing him. They all escaped except Shocker, whose memories had been altered by Egghead. Pym was brought back to Egghead, who told Pym he was a fugitive and had no choice but to aid Egghead now. Pym, despairing, agreed. (Avengers I#229) - Egghead put Pym to work on the proposed longevity machine, which would theoretically lengthen human life, and continually taunted Pym as the days passed. When Pym announced that the machine was complete, Egghead and his Masters of Evil were suspicious, having expected Pym to take months to complete it. They put Pym in the machine to test it, and was shocked when the machine gave Pym a forcefield and the ability to control the Beetle's armor. He made short work of the Masters, having developed appropriate traps for them over the previous days, including cadmium-plated grippers for Radioactive Man and a disruption stunner. The Avengers (Captain America, Captain Marvel, Hawkeye, She-Hulk, Thor, Wasp) investigated, having broken through Shocker's brain-washing, and helped wrap up the Masters. Pym stepped down and taunted Egghead, who gave into a rage and tried attacking Pym physically, but Pym punched Egghead aside. Egghead drew a gun from his coat and prepared to fire it at Pym, but Hawkeye, who'd been watching from the side, fired an arrow into the gun. The gun exploded, killing Egghead instantaneously. (Avengers I#230) - Pym was cleared of his crimes, the Masters were arrested, and Trish's brainwashing was reversed. She, with Pym and Fred Sloan, scattered Egghead's ashes at sea. (Fall of the Hulks: Alpha#1 (fb)) - The Intel were disgusted to learn of Starr's death. (Vision and the Scarlet Witch II#5 - BTS) - Egghead (or a simulacra) was one of several deceased villains who assaulted the Scarlet Witch while she was in the land of the dead. (Ant-Man Annual I#1) - Egghead survived death by using his patented Rejuvetech Serum. Years later, he plotted his revenge. Raz Malhotra, an employee of Tech-Busters, showed up on a work call, but Egghead knew he was a robotics expert and wanted his help in launching the A.I.-Vengers (robots of Captain Marvel, Hawkeye, Beast, Wonder Man, Thor, Iron Man, Captain America), based on Pym-robotics tech. Egghead forced Malhotra to comply by using a neural override device. Pym and Ant-Man attacked and fought the A.I.-Vengers, who spouted positive things about Pym as he had programmed them to do. Raz later became the new Giant-Man. (Uncanny X-Men III#5) - Egghead interacted among other criminals aboard the Queen Kathleen ship. (Astonishing Ant-Man#12) - Egghead was hired by Darren Cross, whose son Augustine Cross was in a coma. With Crossfire, they broke into a S.H.I.E.L.D. facility, accessing the "Layaway Department" (room for confiscated technology), then shrunk down into Ant-Man's helmet to access Hank Pym's lab. Inside, they found all of Pym's research, a shrunk down Scarlet Beetle, and an empty Yellowjacket suit, which Darren Cross then put on. (Astonishing Ant-Man#13) - Yellowjacket adapted to his armor as Egghead and Crossfire watched. They went to the court house and battled the assembled heroes (She-Hulk, Stinger, Ms. Thing, Machinesmith, and Grizzly) before they were defeated. (Solo II#3) - Egghead, in hiding in Skandia in the Vorpal Mountains, learned that a weapons deal plot he had with the Zoo Family had been thwarted by Solo, and he planned revenge. (Solo II#4) - S.H.I.E.L.D. descended on Egghead’s base, bypassing his ant security robots and arresting him. Comments: Created by Stan Lee, Larry Lieber & Jack Kirby. Thanks to David Wiltfong for the scanning assist on that hard to find first image! The two black and white images were all I had. Perhaps someone can help with color scans someday. Arnim Zola later created a Proto-Husk of Egghead. Egghead's death-ray satellite was later named Samarobryn and used by the Weathermen. Thanks to John McDonagh for the summary of Egghead's involvement in the Spider-Man novel, Untold Tales of Spider-Man. This is apparently set to take place between Amazing Spider-Man I#2 and #3, and the title of the chapter is "Side by Side with the Astonishing Ant-Man." In Sensational She-Hulk#53 where She-Hulk visits the mall of the dead, there is a store for Egghead. Turning Egghead into the murderer of Wasp's father in Avengers West Coast Annual#6 was a dig at the 1982 Swamp Thing film which made Anton Arcane behind the murder of Alec Holland, when in the original stories it was actually Nathan Ellery. (Avengers West Coast Annual#6/3) - Dino Domani, the producer of the Arkon films, suggested a few changes to Janet Van Dyne's script for an Avengers movie. One of those changes was to turn Egghead into her father's murderer in her origin story. In She-Hulk II#21 Earth A's Elihas Starr was among the clients of Albert E. DeVoor. He traveled from Earth A to Earth B (Earth-616) for vacation. Starr took over his deceased counterpart's identity for some time. Egghead has Handbook entries in OHotMU I#13, Deluxe Edition#17, Master Edition#7 and Avengers Assemble (2010). Ape and Twister's real names were revealed in Egghead's profile in Avengers Assemble. Thanks to Michael Fischer, who pointed out the missed Egghead appearance in Avengers I#65. Thanks to Per Degaton for reminding us of the Vision & Scarlet Witch and Conspiracy appearance and a few other info you can read above. Egghead received a Handbook entry at the back of the Fall of the Hulks: Alpha#1 book. (Avengers I#222) - When her employer Egghead brooded over not having any ideas left from which to rule the world, Anna suggested he buy the world or invent something new, while sitting in his lap and kissing his head. Suddenly struck with inspiration, Egghead tossed her to the floor. 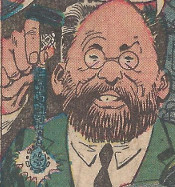 (Tales to Astonish I#45 - BTS) - Designer of a famous diamond pendant, Anton Myers put the pendant on display only to have it stolen by Egghead and his thugs, Ape and Twister. The pendant was later recovered by Ant-Man and Wasp. (Tales to Astonish I#45 (fb) - BTS) - Ape (Donald Jones) and Twister (Mick Bird) were two thugs who were defeated by Ant-Man and his new partner the Wasp. (Tales to Astonish I#45) - At a flophouse, Ape and Twister allied with Egghead, who guided them in a complex plot to apprehend Ant-Man and Wasp. Egghead posed as Carl Striker and set up an exhibit about wasps at the zoo. Using Egghead's technology, they then stole Anton Myers' diamond pendant. Though Ape and Twister wanted to quit at this point, they sprung their trap on the heroes at the zoo, trying to trap them with an iguana, an anteater, and liquid gas. Both Ape and Twister were defeated, though Egghead escaped.